James Angell has friends in high places. Long-time buddy Courtney Taylor-Taylor (is it Taylor-Taylor-Taylor by now?) of the Dandy Warhols fame helped put a copy of James Angell's debut solo record, Private Player, in the hands of such luminaries as Paul McCartney and David Bowie. The latter going as far as to call Angell and tell him how much he enjoyed his album. Duran Duran's John Taylor was another who heard the record and called up Angell to tell him how much he enjoyed the record. Taylor would later begin playing with Angell. Along with other notable musicians such as former Heatmiser drummer and well-regarded producer/engineer Tony Lash and King Black Acid's Daniel Riddle, Angell assembled his group and played a big home-town show in Portland, Oregon to a packed crowd at the Aladdin Theatre on March 14, 2003. 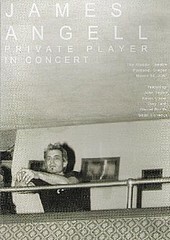 Private Player In Concert is a DVD of that performance. Working out the kinks, if you will, before a sold-out crowd at the intimate Lola's Ballroom on January 3, 2003, the Aladdin Theatre was the group, now known as Private Player's second show. And what a show it is. Including the nine songs from that performance as well as interviews with James Angell, John Taylor, and Daniel Riddle. Private Player In Concert gives you a bird's eye view of the motivation and passion behind the record, as well as a look at the stunning, awe-inspiring live show the band was able to capture on the big stage of the Aladdin. The camera angels are good. The music sounds clean, precise, and lively, the band at the top of their game. Everyone is enjoying himself or herself. It's more than a show, it's a performance, it's music and entertainment. Fans were treated to more than just a rock band playing on stage. They got their monies worth and more. For those who were/are curious, but didn't have time to go to a club to see the band live. Or those who were unimpressed with the record (I must confess, Private Player did nothing for me - until I saw this DVD), here is something that will change your mind and perspective.